There was a sense of sadness when fans tuned in to watch the ninth episode of Ash vs. 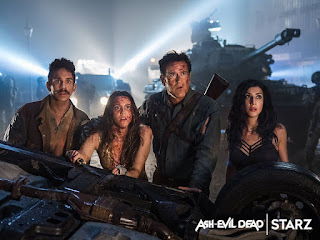 Evil Dead's third season when it first aired back in April, because just two days earlier star Bruce Campbell had made the official announcement: Starz had cancelled the series, and season three would be its last. 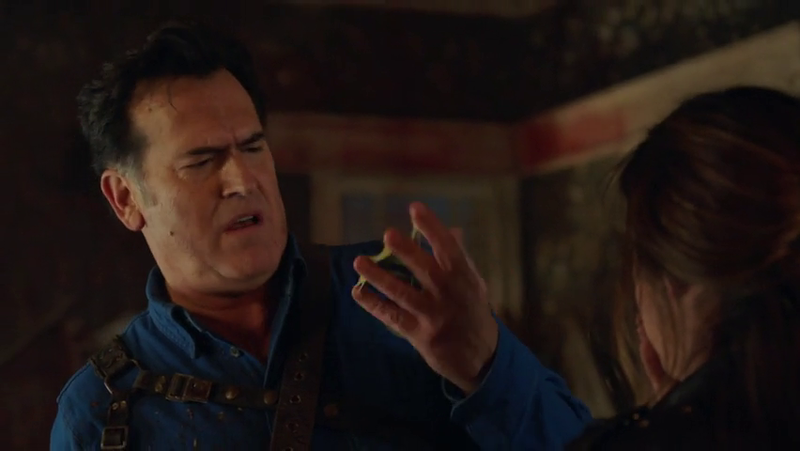 There were only two episodes left to watch, and now we had to face the fact that those two episodes might be the last time we'd ever see Evil Dead franchise hero Ash Williams (Campbell) in action. At least in a new adventure - we'll always have the three Evil Dead films and the three seasons of this show to return to again and again. But Campbell had said that Ash would likely be retired for good if Ash vs. Evil Dead was cancelled, and now the moment we had been dreading had arrived. The threat of cancellation hung over the entirety of Ash vs. Evil Dead, fans always knew it was a possibility. Not only because of the show's dwindling viewership (on the Starz network anyway; since not a lot of people subscribe to Starz, Ash vs. Evil Dead was one of the most highly pirated shows on TV), but also due to the fact that new owners had taken over Starz between the second and third seasons, and Ash vs. Evil Dead did not seem to be a high priority for them. For example, there's the fact that they delayed the show's premiere until February (previous seasons had started in the fall, around Halloween), then sabotaged it further by having it air on the same night and at the exact same time as another horror show that happens to be one of the biggest shows on TV (even now, with its own viewership dwindling), AMC's The Walking Dead. Ash vs. Evil Dead barely stood a chance. I had heard that Campbell, producer Rob Tapert, and franchise creator Sam Raimi had gone into this series endeavor with a plan to keep the show going for five seasons. It has come up two seasons short, but the vindicated concern that season three might be their last did supposedly lead the producers, writers, and showrunner Mark Verheiden to craft a season finale that could also function as a series finale if necessary. Building up to that finale is the penultimate episode 'Judgement Day', which was written and directed by Ash vs. Evil Dead veteran Rick Jacobson, whose association with the series goes back to the first season - he directed the season one episode 'The Dark One' and returned to direct three episodes in season two: 'Home', 'Home Again', and 'Second Coming'. As Jacobson's story begins, the demonic beings known as the Dark Ones are threatening to enter our world through the rift to the Deadlands dimension, which Ash has just returned through with his recently discovered daughter Brandy Barr (Arielle Carver-O'Neill). The imminent arrival of the Dark Ones has the villainous Ruby (Lucy Lawless), a Dark One herself who betrayed her fellow demons, in such a panic that she is working to add a new flesh and blood page to the Necronomicon, the Book of the Dead that she helped write long ago, that will help her avoid the vengeful wrath of her former cohorts. Aiding her in this project is the sorceress Kaya, whose spirit has taken up residence in the body of Ash's sidekick Kelly Maxwell (Dana DeLorenzo) - whose own spirit is still trapped in the Deadlands. Within the first ten minutes, all hell is breaking loose in Ash's home town of Elk Grove, Michigan, with evil forces roaming the streets and people getting possessed left and right. While the town is going full-blown apocalypse, Ash is on his way to a final confrontation with Ruby - and in true Ash fashion he takes the opportunity to eat some potato chips, drink some beer, and listen to classic rock while driving over to Ruby's place. With Ash's other sidekick Pablo Simon Bolivar (Ray Santiago) having been assigned to guard the rift in the cellar of Ash's hardware store, Brandy is left alone at Ash's house... and her experience while alone there is the true highlight of this episode, as the evil forces arrive at the Williams residence and put Brandy through the wringer in much the same way they've been putting Ash through the wringer ever since the first Evil Dead movie almost forty years ago. There are some great visual and situational homages to past Evil Dead moments in this sequence, including a shot where camera - in the evil force's point of view - pursues Brandy through the house, and a moment where she holds a door closed while the force slams into the other side of it. She even gets to drop some classic Ash lines. Brandy also has to slam herself around when an evil object attacks her hand, although this doesn't get to quite the same Three Stooges-esque level of slapstick that some of Ash's hand issues have reached. She does receive a hand injury, though, and anyone who has seen Evil Dead II will be expecting her to have to cut off her hand just like her dad had to cut off his own evil-infected hand. Beyond the fun homages, 'Judgement Day' takes some major strides toward wrapping things up, and even takes some characters out of the equation in a quicker and easier way than I expected. This sets up a battle between Ash and the ultimate Deadite that is meant to "test the mettle of man". If there's any man I'd want to see get tested by the forces of evil with the fate of the world hanging in the balance, Ash Williams is that man. Win and save us or lose and damn us, it's going to be entertaining to watch either way. I'm excited to see how this is all going to turn out in the next episode, but it's going to be a very bittersweet episode to watch. Whatever the finale brings, 'Judgement Day' was a great lead-in for it.